I made it to 36 weeks. Wow! I can’t believe it. I am really going to be a mom! 🙂 It all seems so surreal to me. I think Keith and I are both a little nervous about Trey’s arrival. Life as we know it is going to change and that’s scary for us. 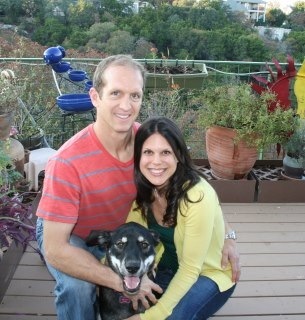 We’ve been together for 9 1/2 years (married for 7 1/2) and it has always just been us: Keith and Kelly. We are so beyond excited about Trey entering our lives but I think we are both just a smidge apprehensive about it. I mean we have no idea what we’re doing! Ha! But I know that with the help of friends and family and just following our own path we will figure it all out. 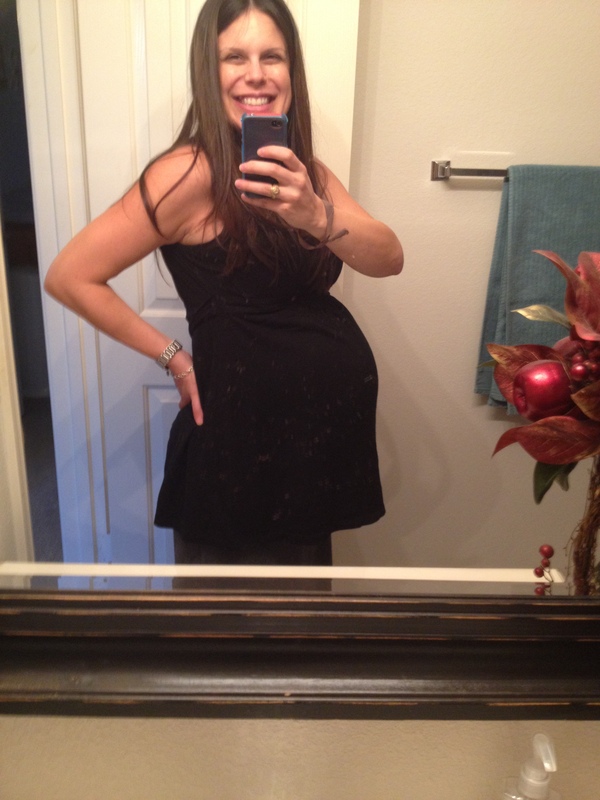 I just sometimes look at my belly and think…holy cow! I’m really going to be a mom in a few weeks. Weight Gain: I’m up 28 pounds. Inching closer to that 30 pound mark. Honestly, at this point I so don’t care. I’m uncomfortable as hell so I doubt a few more lb’s is going to make much of a difference. I have started putting a pillow under my back at night and it has helped take some of the pain away. The only thing that bothers me is when people make comments about how huge I am. It is like people don’t think pregnant women have feelings. I know I’m big but I don’t really think I am that big. But whatever. Stretch Marks: Still NONE! I can’t believe it. But I am hoping that continues. I am so close! But as my belly stretches to it’s maximum in the coming weeks I will definitely still be using lotion twice a day. Swelling: Still none thank goodness. I still have ankles and my wedding rings still fit fine. I am considering myself lucky on this one! Although I know swelling can pop up really suddenly in the last few weeks I have been super lucky on that front. Movement: All the time. Trey is active and I love it! I also realized what hiccups felt like and he hiccups quite a lot. I always drink a lot of water when he starts hiccuping but then Keith told me he doesn’t think me drinking water is going to help Trey. All it is doing is making me pee more. Ha! Sleep: Eh….not great. I am usually up anywhere from 3-5 times a night to go to the bathroom and I am uncomfortable. Sleeping on my sides isn’t great because my hips and back start hurting half way through the night. I was a tummy sleeper in my pre-pregnancy life and I am so ready to sleep on my tummy again. Plus in recent weeks Bella has taken to sleeping most (if not all) of the night with us in bed. She nestles in close to me (which, who am I kidding, I LOVE) but she makes me even hotter than I already am! WHEN IS FALL COMING TO TEXAS?! I know I shouldn’t complain, our high today is only 88 which considering I spent my entire second and third trimester in 100+ degree heat almost everyday this should feel like a regular cold front. Everyone is wearing cardigans and boots. Me? I am in tank tops and shorts. Ha! So, that’s it. Like I said I have my 36 week appointment today and I am also getting the Group B Strep test…cross your fingers. I would prefer that to be negative. 🙂 I’ll update again soon. Put a pillow in between your knees, that always helped with my hip pain. Or scissor them out when you sleep – although you might be too far gone for that move – it didn’t work at the very end for me. And psssh people need to hush about your size. 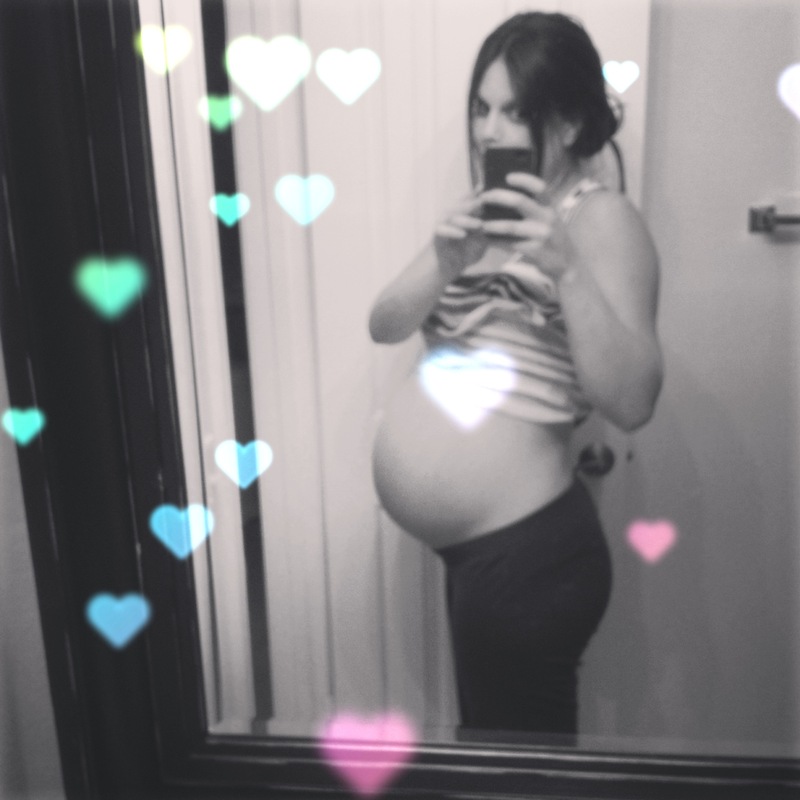 Go look at my 36 week picture and then we can talk about big. You look FANTASTIC!!! I do sleep with a pillow between my knees but I haven’t ever done one behind my back until recently. I do scissor my legs…that helps a ton!! You look awesome! I hope your appointment goes well– can’t believe you’re so close now! So excited for you! Love these updates and can’t wait to see you as a momma! You are THE cutest. I am just so thrilled for you guys. It will definitely be an adjustment, but such a good, good, good one. You guys are going to be the best parents and have so much fun being mama and daddy to that sweet boy.